Only a few years ago, if you needed an appraisal of The revolution in the personal property appraisals gems and jewelry for any reason, you asked your local field (of which jewelry is a part) is a little more than a jeweler, who hastily scribbled a one-line handwritten decade old. There now exist uniform standards and note. He or she usually performed the appraisal for procedures for personal property appraisers, classes free, and did so with reluctance, accommodating you in valuation techniques, and degree programs in the only because as a customer you held the promise of a valuation sciences. future sale. 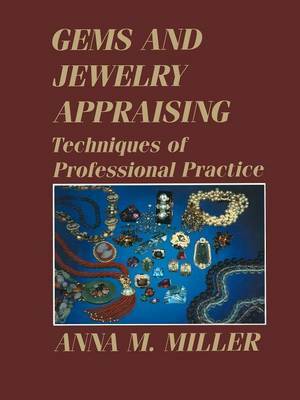 The price your jeweler may have assigned Professional jewelry appraisers are on the edge of to the jewelry was granted without the least regard a new vocation. Banks, insurance companies, and for market research, legalities, or ethics. In most in- governmental agencies have all helped bring about stances, the estimate was no more than a properly the changes and contribute to the birth of the profes- completed sales receipt. sion; they have realized that they can demand and Gemologists were usually pushed into the role of get high standards of performance and integrity from appraiser by their jeweler employers, who were eager jewelry appraisers, as they can from appraisers of real to gain an advantage over their competitors by adver- property.